Wyndham Tropicana at Las Vegas provides guests with a classy and comfortable accommodation with the luxury of prime location. Close to the strip, the resort provides quick access to all there is to see and do. Wyndham Tropicana at Las Vegas separates itself from the competition as it offers a full kitchens and private balconies or patios. This adds a level of convenience, other accommodations cannot compete with. The resort also offers free covered parking and helps you stay connected with free WiFi. One would think with so much to do in the surrounding area, there would not be a need for the Wyndham Tropicana to offer many amenities to their guests. This is not the case as the list of amenities is extensive. The resort amenities include a pool and five hot tubs, complimentary WiFi, fitness center, local golf courses, BBQ area, and free covered parking. For those staying more than 8 days, on the 8th day, guests will receive limited housekeeping services. What does Las Vegas not have to do? Everything you could think of and more is offered in Las Vegas. The Wyndham, on Tropicana, puts you close to the strip and walking distance to much of what Las Vegas has to offer. From exploring the massive, decorated, multi-million dollar casinos to hiking in Red Rock Canyon, to visiting innovations like the Hoover Dam, there are more activities than one could fit into a typical vacation. Take a look at the list below to see some of the various activities Las Vegas has to offer, and their location from Wyndham Tropicana. Up to six guests are welcome in this classic accommodation that features a master bedroom with one king bed, another bedroom with two twins, and a living room with a queen sleeper sofa, and two bathrooms. You'll also have your very own fully equipped kitchen with stove, oven, refrigerator, microwave and dishwasher. The sizeable dining area has a large table to give guests plenty of room. All suites are on the first or second floor and have stairs in the entry way. The condo was excellent, fit our accommodation needs perfectly. I loved the pool and facilities, and the staff were extremely courteous and helpful. I would definitely stay there again if we go next season. Thank you for the excellent review! We are so happy to hear you took advantage of what the property had to offer and that you enjoyed your stay. Our on-site team work hard to deliver a vacation to remember. We look forward to your return! The place was clean, but the floors were really dirty. My grandson's feet were so dirty by the time we went to bed we had to wash them before he laid down. Other than that the place was terrific. I would've given a 5 star if the floors had been cleaner. Thank you for taking the time to share your recent experience and that you enjoyed your stay with us. We take our guest feedback as a way to improve our service and as such have shared your comments with our onsite team. We hope to see you again real soon! Perfect for our Girls' Weekend in Vegas! Thank you for choosing our property for your stay. We are so happy you enjoyed your stay. 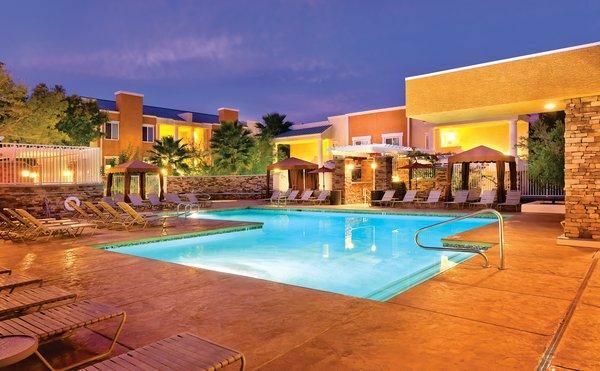 The on site team at WorldMark Las Vegas take great pride in their property and it shows. We welcome the opportunity to host you again the next time you are in town.